Using a simple ACF field you can adjust the WooCommerce pricing type per item with a dropdown selection that will display after the price in the product, shop, cart and checkout page. Create a select dropdown in ACF. 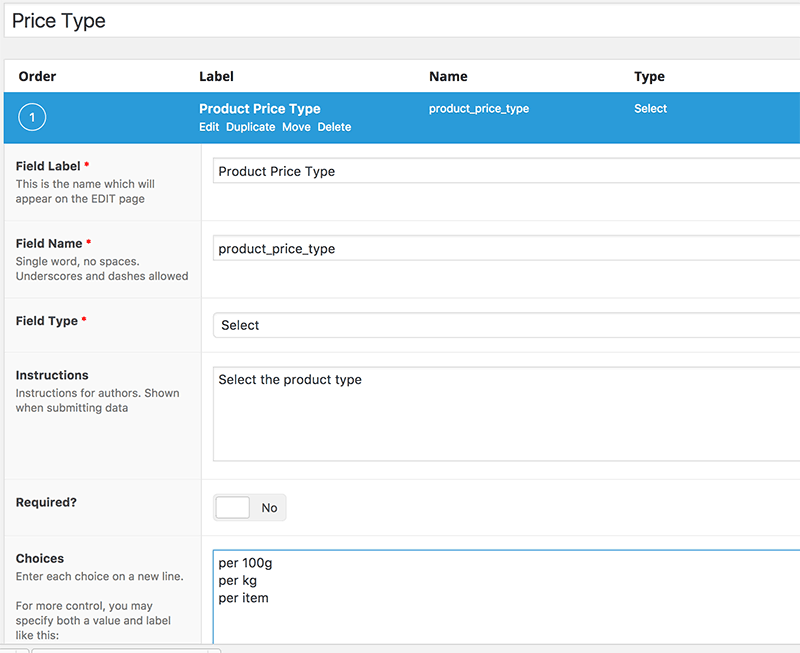 This example the field is named product_price_type and has 3 values/choices (use as many as you like) another option set further down in the ACF settings is to allow a null value for this field so the user is not forced to use one of the values. Three filters need to be used to change the content on the product/shop pages, cart and checkout pages. Same type of idea for the cart page this time using the woocommerce_cart_item_price filter, again I am calling the custom field with get_post_meta, the get_field way is just commented out. For the checkout page the woocommerce_checkout_cart_item_quantity filter is used, same idea, some might think the ‘per item’ etc may look a bit odd on the checkout but here is how you could do it or alter it to something else.